Five history professors will look at infusing History survey courses with resources that more deeply explore diverse perspectives on historical events. The organizing principle for the project will be to move somewhat away from breadth toward depth of coverage, allowing students to develop deeper understandings of important historical topics, themes, and questions. Over the summer of 2012, Professors Rod Clare, Clyde Ellis, Mary Jo Festle, Charles Irons, and Nancy Midgette will conduct research regarding innovative pedagogies and resources that will introduce diverse perspectives into course readings and assignments. During the Fall 2012 semester, these faculty will apply the summer’s findings into several History survey courses, while also identifying ways to assess student learning from these new materials. The Diversity Infusion Project began in 2011 to support the development and implementation of strategies to infuse Elon’s curriculum with the best practices related to diversity, broadly defined. The Multicultural Center and the Center for the Advancement of Teaching and Learning co-sponsor the Diversity Infusion Project. 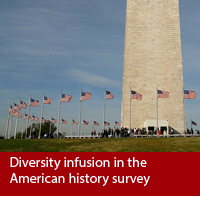 More information regarding the Diversity Infusion Project, current and past projects, and application information are available on the Teaching and Learning website. This entry was posted in Uncategorized and tagged CATL, Diversity Infusion Project, History. Bookmark the permalink. Follow any comments here with the RSS feed for this post. Both comments and trackbacks are currently closed.